Successful sites, according to most metal detectorists, are those with the potential to produce large quantities of quality coins and artefacts from all periods; Bronze Age to modern. 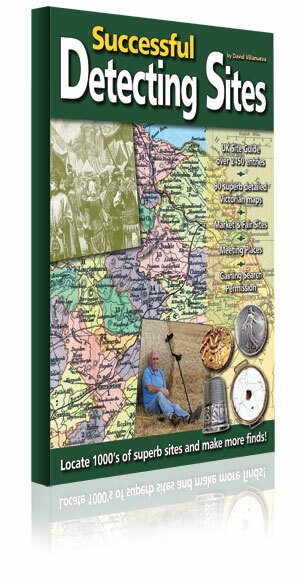 Using rare 18th & 19th century sources, David Villanueva has drawn on over 30 years experience in metal detecting and historical research to compile this exciting guide to thousands of potentially successful detecting sites throughout the United Kingdom, with histories stretching back hundreds or even thousands of years. This is the only site guide you will ever need for the author of Site Research explains clearly how to generate a host of successful detecting sites from every place in the guide, which will keep your finds bag overflowing for years to come. And to lead you to these Sites, there is a wealth of valuable information included together with superb facsimilies of 90 highly detailed Victorian maps covering every UK county so you get a complete antique county atlas as well. Great Britain (1846) and are by the reknowned mapmaker Joshua Archer. They contain an abundance of information for the detectorist such as detailing the Hundreds, market towns, manors, polling places, roads, rivers, canals, mail coach routes and the few railways that existed at the time. Also included are many castles, abbeys, priories, Roman sites and even some coin hoards. The maps for Scotland and Northern Ireland come from two Philip’s Atlas’s published in 1882 and 1883 and are by another famous mapmaker, John Bartholomew. They outline every parish in Scotland and every barony in Northern Ireland. The Channel Islands and Isle of Man maps come from the National Gazeteer published in 1868. 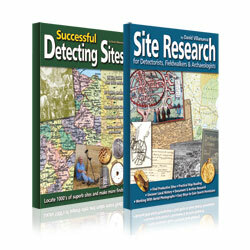 Buy both Site Research & Successful Detecting Sites and Save £5!